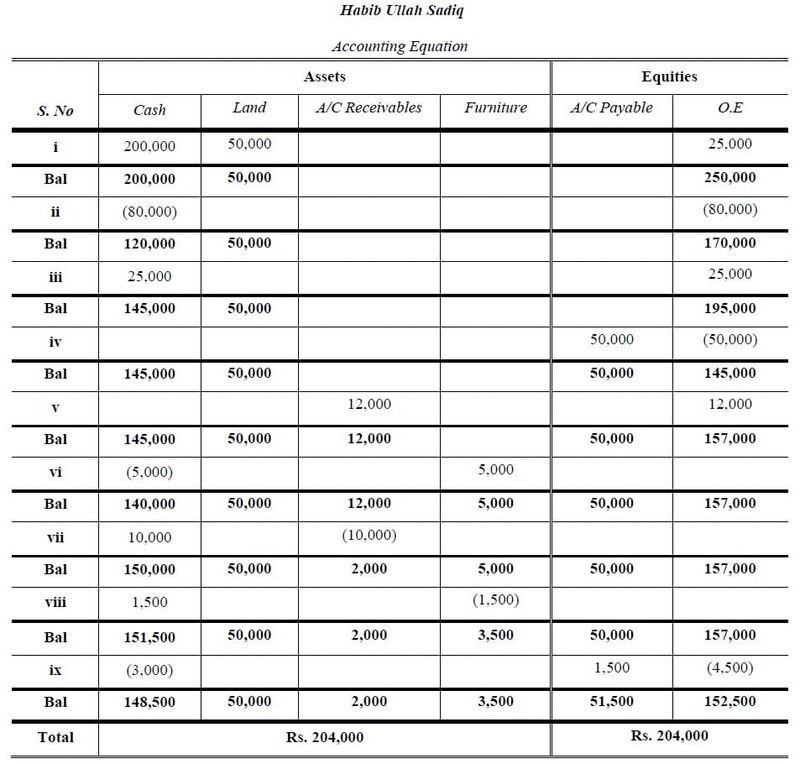 Habib Ullah Sadiq is wholesale trader; following transactions are record in Accounting Equation? i. Commence business with cash Rs. 200,000 and Land Rs. 50,000.
ii. Bought merchandising for cash Rs. 80,000.
iii. Cash sales of worth Rs. 25,000.
iv. Bought goods on credit from Salman of worth Rs. 50,000.
v. Sales on account to Ali Raza Rs. 12,000.
vi. Purchase furniture of the value of Rs. 5,000 by cash. vii. Received cash form Ali Raza of Rs. 10,000.
viii. Return defective furniture of worth Rs. 1,500.
xi. Paid wages Rs. 1,000, Rent 2,000 and Electricity Bill Payable Rs. 1,500. 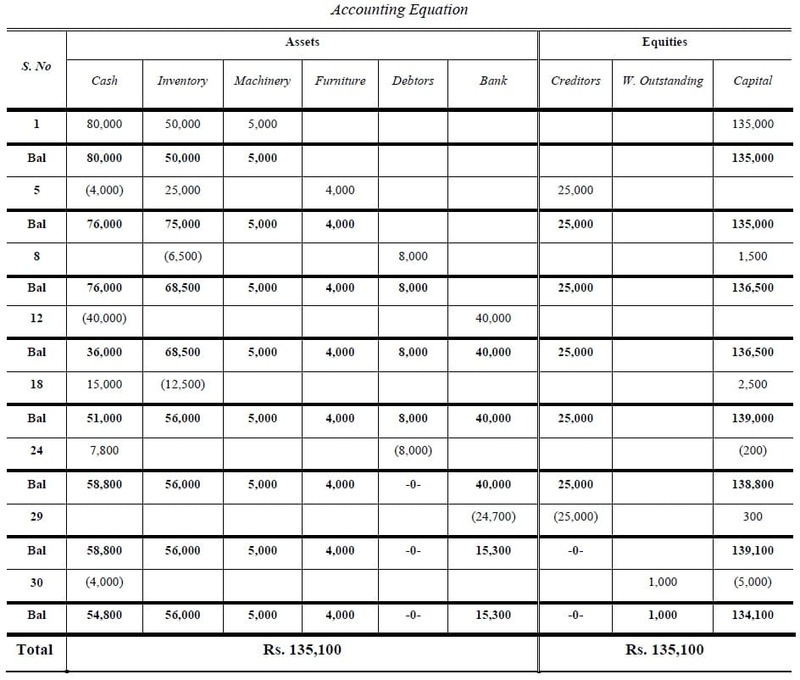 >> Read Accounting Equation explanation. Muhammad Faizan Abid had the following transactions. Use accounting equation to show their effect on his Assets, Liabilities and Capital? a) Invested Rs. 15,000 in cash. b) Purchased securities for cash Rs. 7,500.
c) Purchased a home for Rs. 15,000: giving Rs. 5,000 in cash and the balance through loan account. d) Sold securities costing Rs. 1,000 for Rs. 1,500.
e) Purchase an old car for Rs. 2,800 cash. f) Received cash as salary Rs. 3,600.
g) Paid cash Rs.500 for loan and Rs. 300 for interest. h) Paid cash for expenses Rs. 300.
i) Received cash for dividend on securities Rs.200. >> Understand Types of Accounts for Accounting Equation Problems and Solutions . 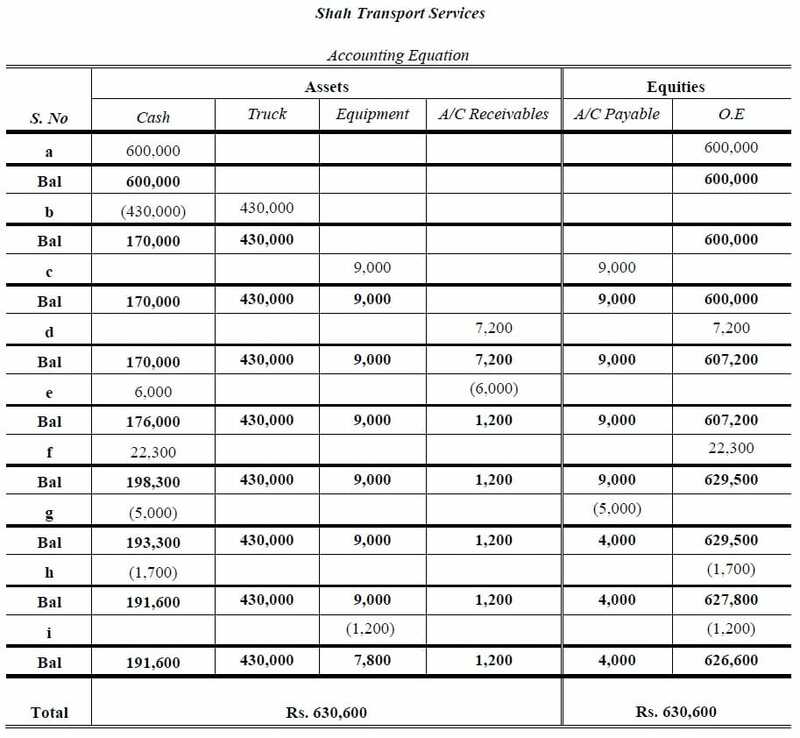 Selected Transactions from Shah Transport Services began on June 1, 2016 by Zahid Shah as? a. Zahid Shah invested Rs. 600,000.
b. Truck was Purchase by business for Rs. 430,000.
c. Equipment purchased on credit for Rs. 9,000.
d. A bill of Rs. 7,200 for transporting goods was sent to Mr. Ashraf Abbasi, a customer. e. Cash of Rs. 6,000 is received from the customer who was billed in d.
f. Received Rs. 22,300 is cash for transporting goods. g. A payment of Rs. 5,000 was made on the equipment purchased in c.
h. Paid expenses of different types for Rs. 1,700 in cash. i. Equipment of Rs. 1,200 was withdrawn from business for Zahid Shah’s personal use. >> Further study Golden Rules of Accounting. 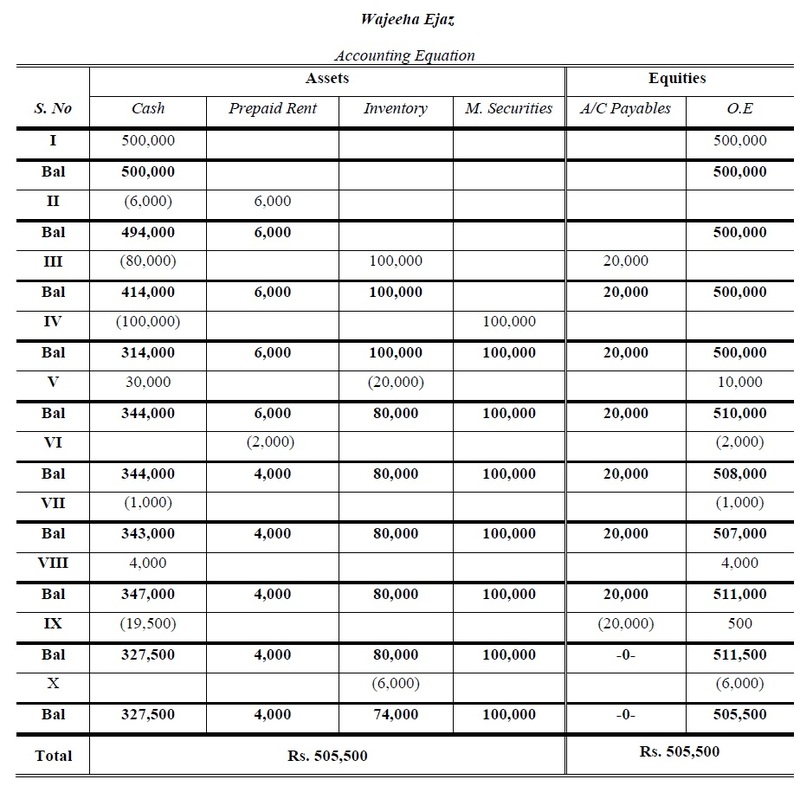 Prove that the Accounting Equation is satisfied in all following transactions of Wajeeha Ejaz owner of business enterprises? I. Started business with cash value of Rs. 500,000. II. Rent paid in advance for a year Rs. 6,000. III. Purchased merchandising inventory for cash Rs. 80,000 and on account Rs. 20,000 from Mr. Tahir. IV. Purchased Marketable securities for cash Rs. 100,000. V. Cash Sales Rs. 30,000 (cost 20,000). VI. During the period rent expires Rs. 2,000. VII. Commission paid during the trading was Rs. 1,000. VIII. Received cash dividend Rs. 4,000 on marketable securities. IX. Paid to Rs. 19,500 to Mr. Tahir in full settlement. X. Withdrew inventory for personal purpose by owner of worth Rs. 6,000. Show the effect of the following transactions upon the Accounting Equation? 1 Mr. Salman started business with cash Rs. 80,000, Inventory Rs. 50,000 & Machinery Rs 5,000. 5 Purchased furniture for cash Rs. 4,000 and purchased goods from Naveed store of Rs. 25,000. 8 Sold goods to Rashid on credit basis for Rs. 8,000, costing Rs. 6,500. 12 Open a bank account and deposited Rs. 40,000. 18 Sold goods for cash Rs. 15,000, which is 20% above cost. 24 Received Rs. 7,800 from Rashid in full settlement for June 8th transaction. 29 Paid Rs. 24,700 to Naveed store in full settlement for June 5th transaction by bank. 30 Paid rent and salaries for the month Rs. 4,000 and wages outstanding for month Rs. 1,000. 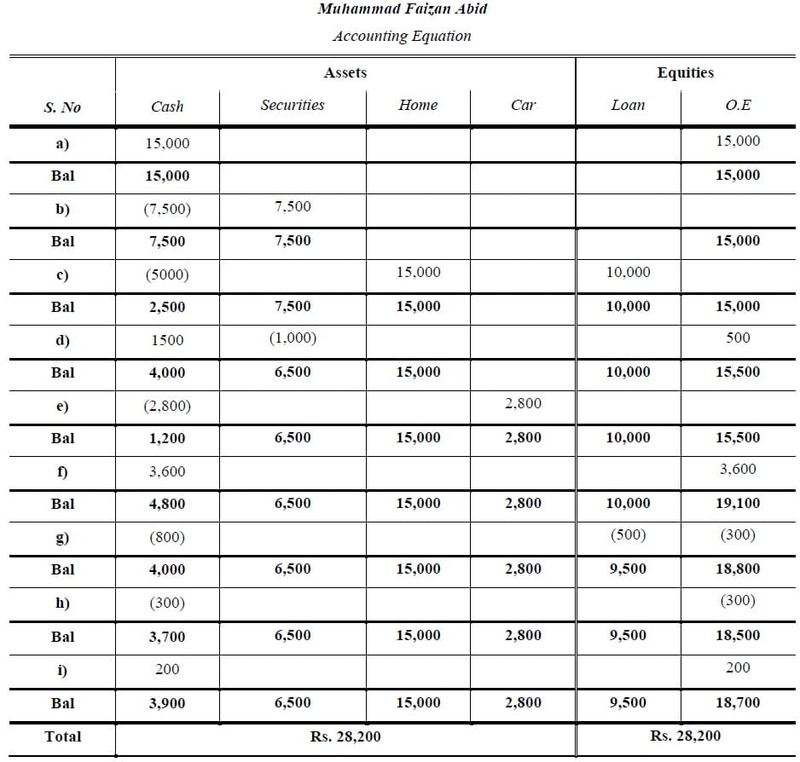 >> Read Balance Sheet for better understanding the Balance Sheet Equation. Heya i am for the first time here. I found this board and I find It really useful & it helped me out a lot. I am hoping to provide one thing again and help others such as you aided me.